A week gone? A horse gained? Where did this week go? I knew it had been a few days since I had posted, but nearly a week?! I must've lost a few days in there somewhere. I don't post a lot about my horses and training here, but I figured I'd share this past week with anyone interested. This week has been chock full of hard labor and exhausted evenings. Saturday was the first horse show at Constantine Farms where I keep my lesson program and, as I'm the one running the shows this year, you can imagine I was pretty exhausted afterward. With the arrival of one of our trailered in horse-show participants came the arrival of my new-old project horse, Esme. She has been on pasture board at a friends' barn for the past year and a half and has had more than a year off of work due to her "special" tantrums. 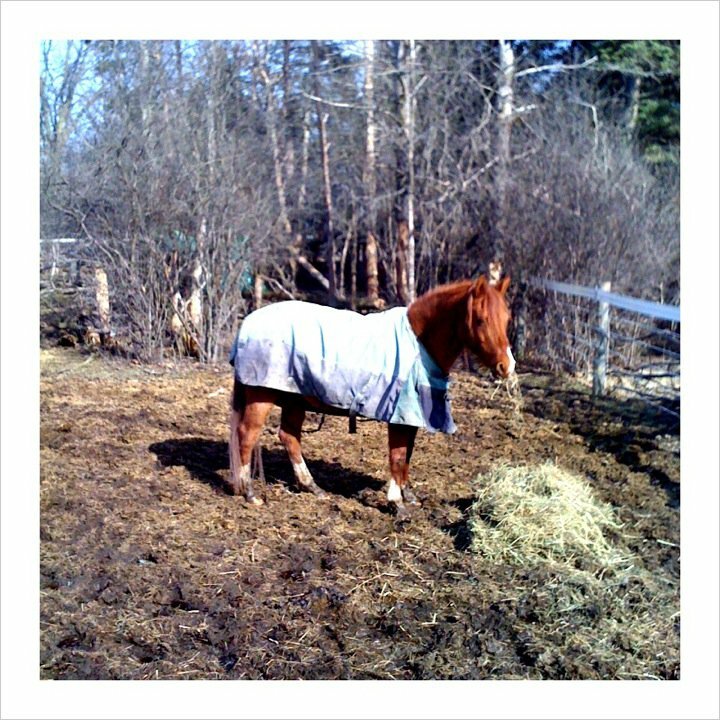 Her special tantrums included some pretty intense rears and in running a horseback riding lesson program it's pretty important that your school horses don't scare kids away from the sport. I decided to try to sell her, and when that failed, I just let her sit up at the friends' farm with her buddies, eating high-quality hay, getting fat and enjoying life. Ah well. This past month, however, I decided to give her another go. She's too fat to rear anyway, so my goal is to condition her to overcome (work through) her tantrums before she's lost enough weight to rear again. Haha. Sounds like crazy talk, I know, but so far so good! I have had three successful rides on Esme at this point, and in each one I could feel her tense for a tantrum and then (like The Incredible Hulk trying to calm himself) think through things until she was calm again. Gosh I hope she keeps this up. She has some of the flashiest movement of any of my horses and I long to show her in dressage, but it's really her call when it comes down to it. 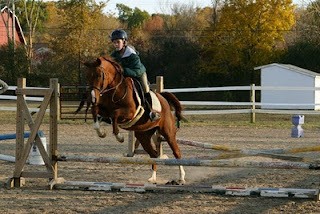 When I had her working in lessons a few years ago she was really a nice horse. She was sweet, attentive and only a little speedy. 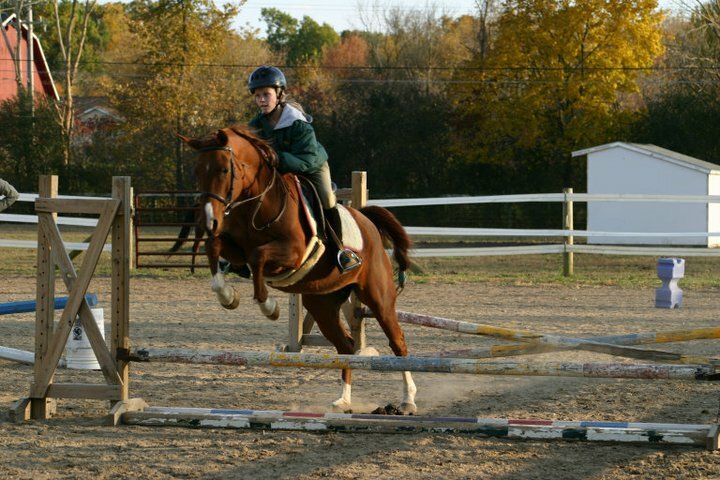 She jumped, was working on second level movements in dressage... essentially she was a great little pony, but I always felt like there was a connection missing that I had with my other horses. She rarely looked to me for guidance, and in a pinch she always resorted to her own means of navigating problems. 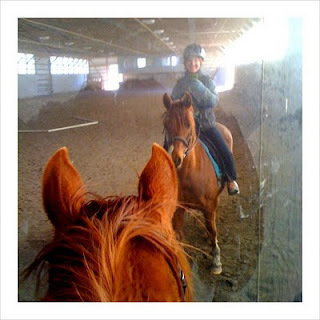 If you're riding a horse and it makes it's own decisions in a tight spot, you may as well be riding a runaway train. They're living creatures which is part of what makes the sport so fun, but it's also what makes it so challenging and dangerous. If Esme would just admit that maaaaaaybe the humans are onto something and maaaaaaybe she should try looking to them for guidance when she's nervous, she would be a fantastic riding horse. I've seen glimpses of that attitude this week, so my hopes are high. A few weeks ago I stumbled across a great little recipe for crackers from my new favorite food blog, Eat Make Read. With the Real Food Challenge going on over at Not Dabbling, I've been hard pressed to find snack foods that I can enjoy on all levels. Sure there are the "real food" potato chips made simply with potatoes, olive oil and sea salt, but they're still just starches and oils when it comes down to it. I wanted something actually good for me and it seemed like a lot of other bloggers were finding success in crackers. 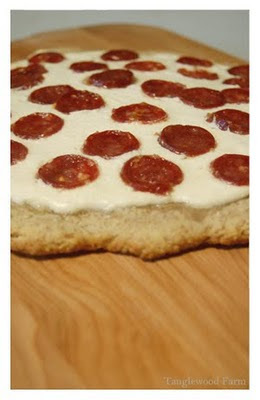 The recipe on Eat Make Read is here and is a great starting place for a base cracker. I decided I wanted something different though. My first batch followed the recipe only loosely. 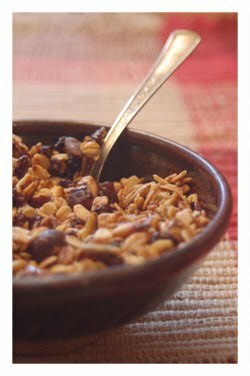 I substituted maple syrup for the honey, used nonhomogenized whole milk and tossed in a large handful of flax seeds. Success! Okay, success, but not exactly exciting. I perused the shelves of spices and considered all sorts of things... then I spotted it. A little glass jar filled with the curry spiced I got from The Seasoned Home in Holland, MI back in January. I wonder if I could make a curry cracker! Popped them in the oven and Ta Da! Curry Crackers! My post over at NDiN today is about improvisation in the kitchen and I encourage you to read it. It's amazing what a little internet research can do for those straggler ingredients lying around the kitchen! My next batch of Curry Crackers I am going to try to add puree zante raisins to the milk before adding it to the dough. I love the taste of zante raisin and curry! Have you tried making your own snack food before? Did you add your own variations to the recipe? You can find me blogging at Not Dabbling in Normal on Fridays as well as throughout the week for collaborative posts. This morning out of sheer irritation with the cruddy weather I ventured into my kitchen, determined to use whatever we had lying around to make a special lunch. What did I end up with? Whole wheat pizza with maple-lime ricotta and abruzzese sausage. Wut?! I'll be blogging this Friday over at Not Dabbling in Normal where you'll find this recipe along with a brief description of how I use whatever is laying around to improv in the kitchen. You'll also be able to read about why I should be required to wear safety equipment for any and all endeavors in my life. I caught Ingrid in a particularly regal pose this morning and wanted to share. I have to wonder how many blogs out there have posts titled like this one. Jeremy and I have been out of town for the past few days for a comic book convention in Chicago, so I managed to miss almost all of the amazing 50-60º weather that Michigan decided to tease us with. I'm almost glad, since we're due another winter storm this week, with highs hovering in the high 30's. Ah well. Yesterday was the first day of spring, and I can feel the shift into growing season more than ever. The chorus frogs are peeping, as are the spring peepers, the songbirds are singing and presenting, the crocuses are peeking up out of the soil over by Cleo's grave and the final harbinger of spring appeared yesterday while Jeremy and I were at the garden center picking up spring garlic and onion sets to plant. What is this final harbinger? The Turkey Vulture! They may very well be the biggest wimps when it comes to winter weather, but they are carrion and between their dining habits and their naked pink heads nobody wants to use them as a spokesbird for anything. I spotted them swooping around outside while in line at the garden center and commented on how they really are a better indication of spring than the robin who has been around for weeks (and weathered many a snow storm) and a petite older woman ahead of me in line turned around to stare openly at me with a look of disgust and mild amusement. Hah. Ah well. Yesterday was a day for potatoes. I've never planted potatoes, and I'm known for working out my own (see also: lazy) ways to try new things. 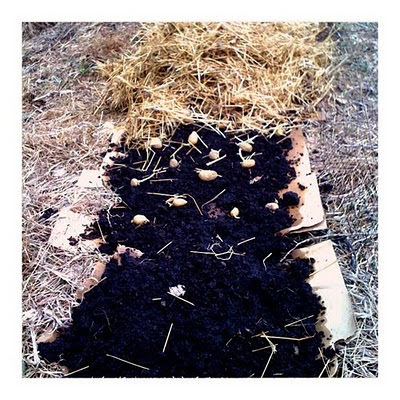 I wanted to plant them in straw, and in a number of places I've read I can just lay them on top of the grass early in the spring before it starts to grow and they'll send their roots through to the soil. Supposedly the thick straw mulch will smother the grass and the potatoes will do their thing. I was skeptical, especially since we have such intense perennial grasses, so I decided to add another step. First I cleared the area of what I could as far as dead grass, branches, etc (A thatching rake is my best friend!) 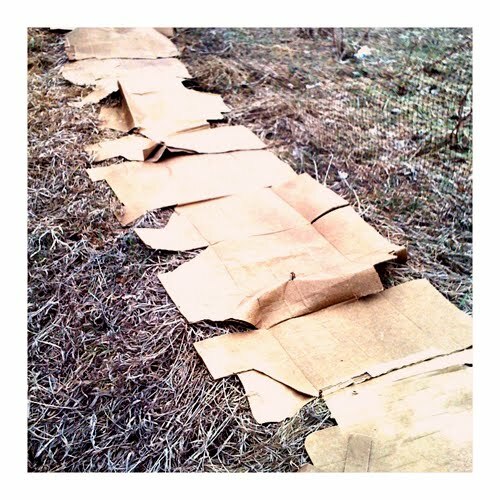 and then I took some of the cardboard that I had laid out through the winter and laid it down where I wanted my potatoes. This cardboard is still intact, but it is very close to decomposition and has wormholes where they've begun to chew at it. My thinking is that once the worms do their thing this spring, they'll definitely chew right through this stuff, but not likely before it smothers the grass. 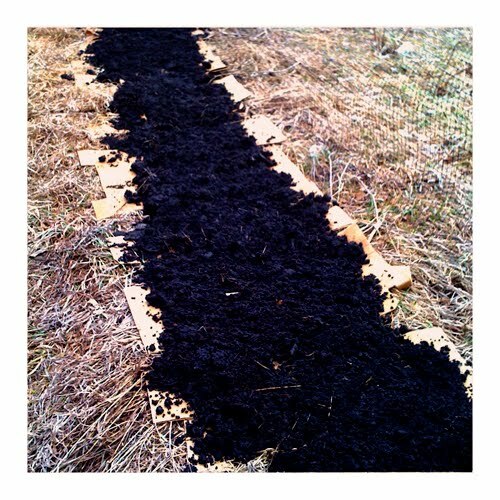 After the cardboard I covered it with a layer of compost so that the potatoes have something to begin rooting in and the worms have a bit of added incentive to get to the other side of the cardboard. I laid the potatoes on the compost and covered them with 4-6" of straw mulch that I had pulled off of the strawberry beds (reuse, reuse, reuse!). These potatoes are not the ones that I ordered from Maine Potato Lady back at the beginning of the year. Those will be planted elsewhere. These are the potatoes that I bought ages ago and tried to store in our potato basket. Apparently the basket gets too much light where it is, because all of the potatoes in it have sprouted! Some of them even grew 12" shoots! Yikes. Ah well. They were all fun, organically grown varieties in various colors so I decided just to plant them and see what happens. I'll keep you all posted on the progress of this bed! On the docket for today: Peas, Garlic and Onions sets have to get in the ground ASAP! Do you grow potatoes? What method have you found works best where you live? 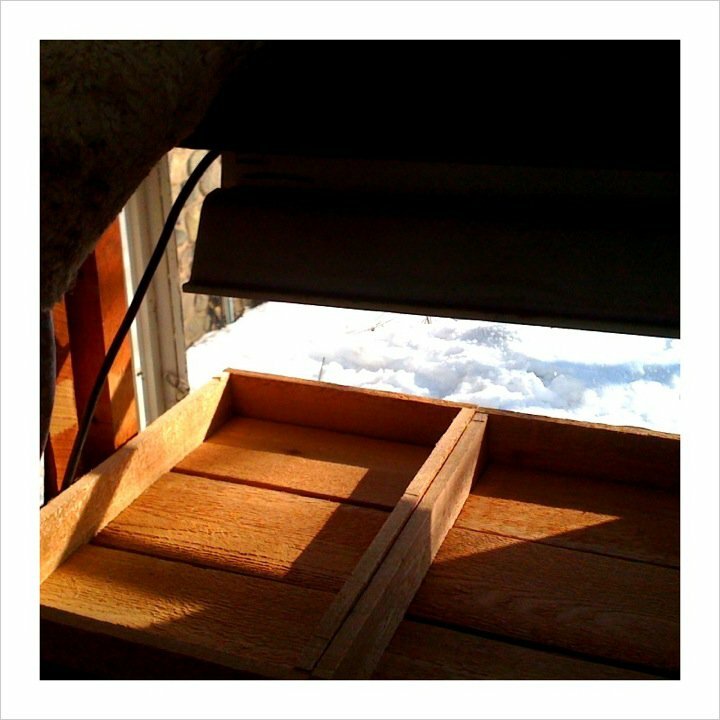 The season is upon us for scrambling around, starting seeds, raking mulch and pulling back the dreary curtain of winter. I can't help but feel totally elated by the season of spring, and totally overwhelmed. Regardless of how much planning I put onto paper during the winter months, nothing can ever prepare me for the explosion of tasks that occurs each year. Two weeks ago I managed to start several seeds for leeks, broccoli, onions and some cold-loving lettuce. I tend to start seeds earlier than I should and I lose so many seedlings each year it's ridiculous. What I don't lose tends to be stringy and unhealthy, so this year I decided to make myself wait until I was certain that I'd be able to transplant them into the garden before they unhappily rootbound or overgrown. This is my first year using my soil blocker rather than plastic trays and cells. It's really quite beautiful to see my seeds starting in all natural context surrounded by wood and soil rather than plastics. 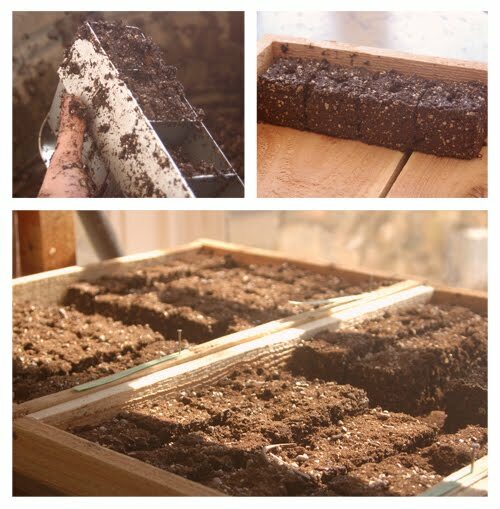 It is more difficult to keep the soil blocks moist, but with some careful misting on a daily basis the seedlings have stayed happy and healthy thus far. I'm still waiting for the onions and the lettuce seeds to sprout, but the leeks and the broccoli varieties are all up. I was very happily surprised that one of the broccoli varieties sprouted at all, as I've had the seeds for at least six years! Next week I will be starting the second phase of seeds, as well as some cool season crops out in the cold frames that i assembled last week (which will be blogged about in the next few days!) 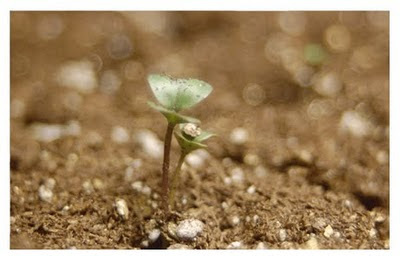 Most of my seeds will be started outside this year since I'm realizing more and more that whenever I direct seed, the plants end up as vigorous, if not more, than their pre-started counterparts. If you've talked to me about chickens you know I'm pretty obsessed. After researching for weeks now, I can rattle of facts about heritage breeds like a pro but I still can't tell you which breeds I want to try! I keep narrowing it down to three breeds or so, and then I discover another one I like. My favorite for now is the Buckeye. Developed by Nettie Metcalf in the late 19th century, it is the only APA recognized breed to be developed exclusively by a female. Unfortunately it was being developed simultaneously with the Rhode Island Red, and which of the two birds have you heard of? Exactly. The Buckeye is a dual purpose chicken that isn't a spectacular layer or meat bird, but is good for both, and everything that I've read says their personality and mousing ability makes up for that. Yes, I said mousing ability. These birds are known for catching and eating mice! 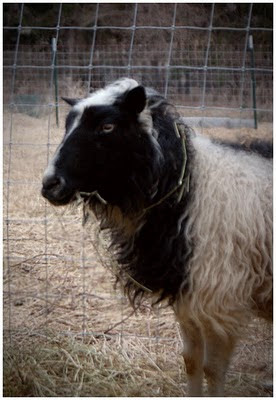 Another breed I'm determined to try is the Wyandotte. They're another dual purpose heritage breed and they come in so many color varieties it makes my head spin! I was set on the blue-laced-red wyandottes, but they are proving difficult to obtain, so now I'm considering the blue wyandottes which are a beautiful dark slate grey color. The last breed I'm pretty sure I'm set on is the Buff Cornish. I want to have chickens for meat, and while I really would like to raise dual purpose heritage birds, I'd also like to have meat before Christmas, haha. The Buff Cornish is a heritage meat breed, derived from the Dark Cornish, which is the ancestor of the modern Cornish X meat birds that everybody grows. The Buff Cornish is pretty much the same as the Dark Cornish, they're just a prettier color. Those are the three I'm set on, as of this morning. Give me two hours and I'll be all over the place again. 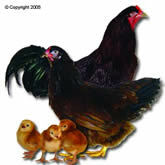 Also, I have two mature Black Marans hens reserved at a local farm to provide quick eggs for us this spring. 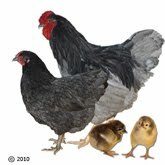 Some of the other breeds I have considered are: Speckled Sussex, Ameraucana, Dorket, Brahma and even Welsummer. They all have their perks. I'll have to keep you all posted about my final decisions. I've been putting off getting chicks so far since Jeremy and I are heading out to a couple comic book conventions and we don't want to have little chicks for our farm-sitters to have to worry about in addition to ducks, dogs, cat and sheep. 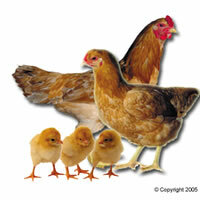 Do you raise chickens for meat and eggs? Are they heritage breed, or more conventional, modern breeds? This photo was taken from a neighboring tree and shows a bit of the roof. I'm considering painting the corrugated metal roof on the barn. It is rust-colored, but other than one panel that seems older than the rest, it is definitely just surface rust. I want to basically do upkeep on this barn to keep it from deteriorating any further at least while we're living here, which I expect will be 5-10 years. Does anyone have experience painting corrugated metal? I'm also planning to reinforce the leaning area of foundation with rebar this spring once the ground thaws. Any tips there? You may remember I posted a video link to The Trip for Life Episode 17: The Calder Bros Dairy a few weeks ago and I wanted to expand on their amazing dairy a bit. My husband, Jeremy, and I finally signed up for milk delivery last week. We have both enjoyed Calder milks before: he, growing up, and I, while in college. It wasn't until around Christmas that a friend mentioned their milk delivery in passing and we began to get excited. Milk delivery? How awesome! Of course there has to be a gigantic delivery fee, we said, we could never afford it. It'll never happen. Calder Dairy keeps their cows locally and fed on farm-raised forage. Their practices are leaning towards sustainable and, while they are not certified organic, they are all natural and there are absolutely no hormones or antibiotics used on their cows. Their dairy and farm are both open to visitors, and you can go see the cows in action, healthy and clean (as cows go). Their milk is bottled in recyclable and reusable glass bottles, which is their signature around here. They have been a family owned dairy for fifty five years! In addition to being a long-standing, local business with a great sense of community, they deliver their products to several local cities and communities (in Washtenaw, Wayne, Monroe and Oakland counties) with a minimal delivery fee of $2.50 a delivery! Yesterday was our delivery day and we placed our cooler out by the fence. Right around 3pm, the dogs started barking and there it was - a giant, cow-spotted delivery truck in our driveway, and milk and bread in our cooler! Our weekly milk is what is called their "Natural" which means un-homogenized, old fashioned cream top milk. The milk is clumpy and thick with cream at the top, and more like skim at the bottom. All of Calder's milk tastes amazing, but their natural milk takes the cake and is amazing to drink, bake with and especially to make cheese with! In addition to milk, Calder delivers their own butter, icecream, buttermilk, sour cream, eggnog, cream,and yogurt, as well as locally sourced bread (all natural), rice pudding, eggs and even cider! I strongly recommend them to you if you live in any of the surrounding counties. They are friendly and pleasant to deal with, and if you have delivery they don't charge you for milk bottle deposits which is another bonus. If you don't live in the area, try searching for local dairies online. I was amazed to find that we actually have three local dairies but to be honest, Calder Dairy stands apart as being the highest quality local milk in the area. Jeremy is such a good sport... Nothing like a milk mustache to show a satisfied consumer. Do you have access to great local food? Were they easy to find, or more like a well kept secret? I've been asked to begin blogging over at Not Dabbling in Normal and will be posting there every Friday! Be sure to check out my first post this morning on my adventures in making granola. This month the writers at Not Dabbling are participating in the real food challenge, and this is proving to be a great excuse for me to start eating more healthily and to start cooking and baking more. The weather has been strange again. I suppose it's not really strange for Michigan, but it is strange for weather. When discussing strange weather, the "strange" aspect of it is automatically negated if you're discussing it relative to Michigan. Our weather is never steady, ever changing, and always full of surprises. Between Friday and Saturday's rains we have had serious flooding in our area. 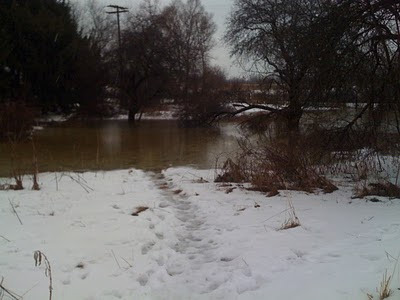 The rivers Rouge and Huron are beyond their banks, the Rouge overtaking the roads and parks in many local areas. It's not atypical around here to have spring flooding, but I admit I've never seen it come so early. Because the ground is still frozen the water has nowhere to go so it collects in vast pools wherever it can. 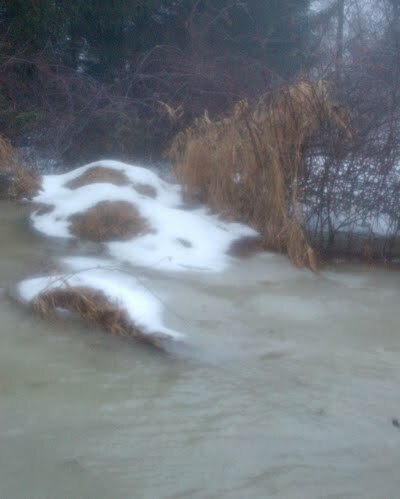 The farmer's field in front of our house is graded to flow right into the old orchard, and so it wasn't long before the water began to add up. A quick walk to the edge of the water showed me that my location for the muck pile is definitely less than ideal if this is how our springs are going to be. All of those wonderful nutrients were leaching right into the water, flowing down into the orchard to fertilize the weeds, I'm sure. By late Saturday, the water had formed a small lake, nearly encompassing our driveway, and I estimate that it was at least 48" deep in some places. It was hard to keep the dogs from venturing out into the water, but they're terrible swimmers so I managed to convince them that the freezing cold water was not a good idea. Sunday produced freezing temperatures, and it was especially cold overnight night, and so this morning I ventured out to find a frozen lake of ice, ripe for exploration. The water has fallen by at least 24" at this point, so there is little chance of me falling in to a dangerous depth. I wish I'd been able to snap more photos, but my camera battery chose this morning to go all wimpy on me. 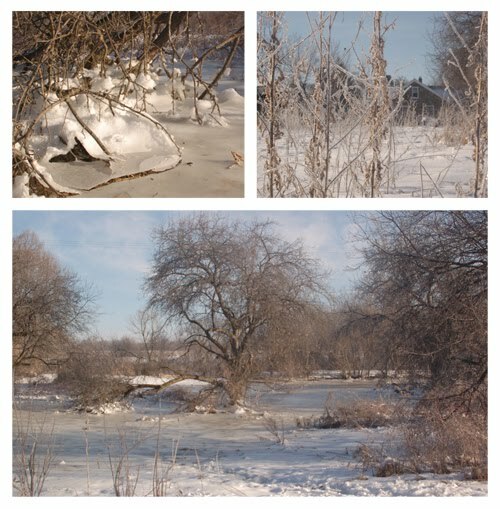 Has the winter been typical where you live, or have you had some interesting surprises? Well, I have to admit I missed the shipping deadline for February's craft swap with my mum. My craft for her, this month, was one that required a lot more planning than simply building an object and decorating it, as with the birdhouse. It was also quite small, and I'm terrible at making small things. I'm pretty decent at crafting, but when it comes to Craft I tend to be a bit on the sloppy side... Anyway, I can't post about my craft yet, but what I can post is that my mom is an amazing crafter! Her craft to me arrived yesterday and I just couldn't wait to share. This month she made and sent me a gardening tote. It's fabulous: sturdy fabric, tons of pockets, and straps the perfect length for hauling to and from the garden with tools, harvest and more. It took me three times to count, but there are sixteen external pockets/slots for tools, and two internal pockets, not counting the bulk internal space of the bag. It even matches the gardening apron she sent me last month! I absolutely cannot wait to use it! I have a few announcements coming up later this week and can't wait to share them. I'll also have a few awesome reviews to post in the next three weeks, so be sure to check back soon! The sap has been flowing slowly but surely this past week, and yesterday I drove out to Roheryn Farms where my spiles are placed. The Shelleys had already gathered 12 gallons from the woods, and I set out into the woods, buckets in tow, to collect the most recent sap. As I glanced behind me, I realized I had quite a lineup following me down the tromped-down path in the snow. Of the dogs, first was Balin, then Berin, and lastly Breggo. They're all brothers from different litters- Springer spanial/Aussie/Cattledog. (The German Shepherd in these photos is Connor). The dogs all get along well, and with the Shelleys dogs and my own, plus occasional visitors from neighboring farms (Lincoln and Reagan) and friends (Wilson, Gizgo) there is often a huge pack of dogs to great anyone who stops by the farm. The best part of collecting sap yesterday was being greeted into the woods by a black cat named Orthanc. 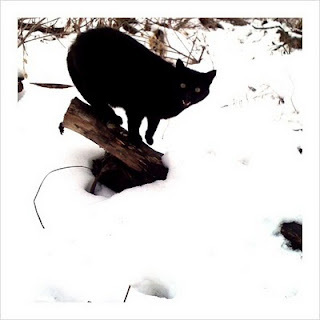 (They also have a white cat, Ecthelion and a grey cat Mithrandir... if you're a LOTR geek like I am, you're no doubt noticing a pattern here...) Trailing behind the entourage of dogs came a swishing black tail, nearly the only bit of him visible in the deep snow. He chirped and followed me from tree to tree, narrating the entire experience in a wide variety of funny vocalizations. What a strange little creature! It definitely made the experience more enjoyable to have a whole company of friends along in the woods. I've been working on building nine wooden seed flats that fit snugly into my seed starting shelves. 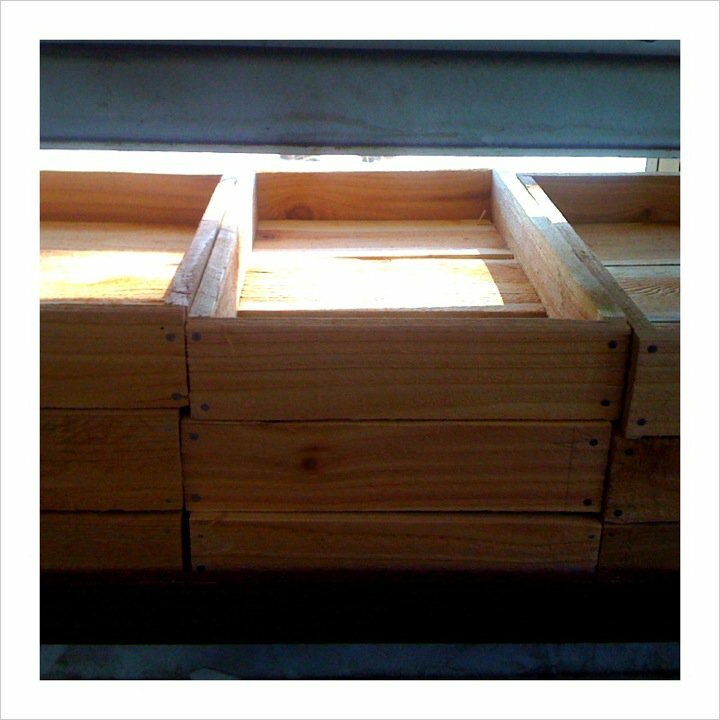 These will be perfect to use with soil blocks that I make with my soil blocker. I estimate these cost me roughly $20-25 dollars to make total, and after some irritating discoveries about the quality of big-box-store nails I've finally finished them! I'll try to post a tutorial for these if anyone is interested. They're made from a batch of locally milled cedar that was cut incorrectly and thus sold at a discount. Do you start your own seeds? What do you start them in? 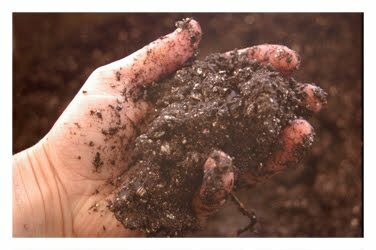 Do you have any plastic free seed starting tips to share?